Purchased by former customer Peter Miller in 2007, Freebird Books has become an integral part of the Red Hook community. The store sells used books, mostly about New York history and culture, but also features publications from local houses, like Ugly Duckling Presse. Freebird also houses Book Through Bars, an organization that provides literature to prisoners across the country. The bookstore is only open Saturdays and Sundays from 11 to 8 P.M., but it’s definitely worth stopping by — if not for the books, then for the comfortable chairs, frequent reading events and, of course, beer and wine! “Human relations are difficult, especially for book people,” this store’s website sympathizes. While getting lost in a well-priced used book from the store (or one of the $1 books on a cart outside) might make you a little uncommunicative, Human Relations itself is the type of bookstore that’s actually conducive to social activity. The shelves are organized neatly, there are books on nearly any topic you can think of, and the store hosts a wide range of events, like plays and readings with sound production and animation. If you’re a book lover who never thought human relations could be your thing, you’ve finally found your spot. It’s the closest thing to world peace that we’ve ever come across: a store that lets you exchange books for beer. If you don’t have any used books to exchange for a tab at Molasses, $3 will get you either a Genesee Cream Ale or a copy of your favorite paperback novel. It’s a tough choice, but fortunately the prices are so low you can afford to get both! Molasses is large enough to host frequent events, but small enough that spending the day sitting at a table reading and drinking a cup of coffee (or wine — we don’t judge) feels perfectly cozy. It’s rare that an excessive reading habit is associated with toughness, so we’re all for this Brooklyn used book shop’s choice of name. 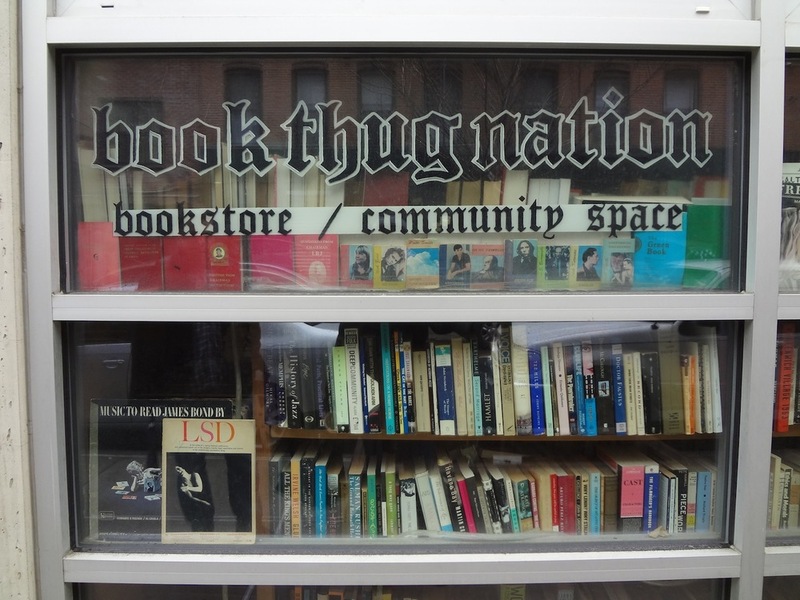 Book Thug Nation was created when four independent booksellers pooled their resources. It’s no surprise, then, that the store offers a well-rounded selection of everything from erotica to children’s literature. 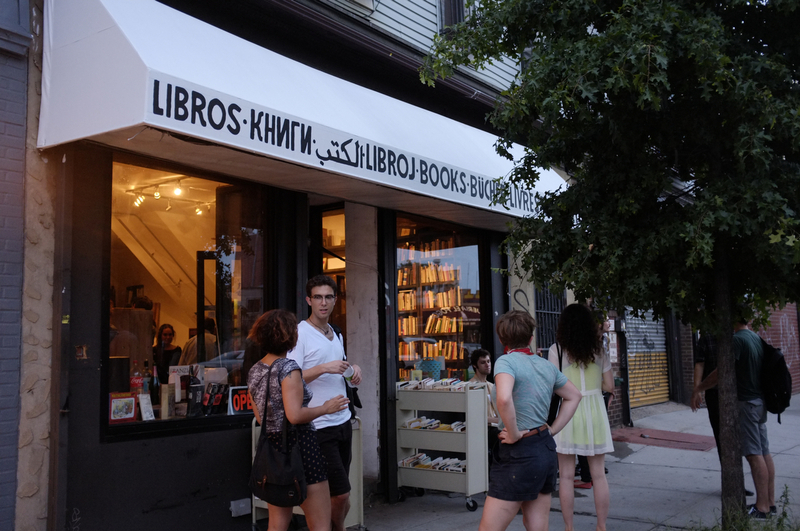 The title “community space” isn’t taken lightly, either; the store hosts events from readings to film screenings, and even gave away free children’s books as part of a summer block party. We’d be willing to call ourselves book thugs no matter the circumstances, but this independent store gives us a pretty great reason. Don’t let the length of the store’s name stop you. (Although we’re guessing that, if you’re a fan of reading, it might actually entice you.) Before entering Unoppressive Books, you’re greeted by a cardboard cutout of Bob Dylan in the window, and once you actually walk inside, there are stacks of cheap books giving you an even warmer welcome. The store stocks everything its name (and cutout of Dylan) would imply. One particularly fun section is titled “Fiction for Young and Rebellious Readers,” a well-curated selection perfect for teens and adults alike. McNally Jackson is a New York City independent bookselling staple, but one that’s worth noting. With a vast and well-organized stock, plus a commitment to carrying independent titles, the store offers the best of both local and chain bookstores. Notable features include book clubs on everything from Spanish literature to comic books and signed books from big name writers and under-the-radar authors alike. If you’re just venturing into the world of independent booksellers, McNally Jackson is your best bet, but even if you already have a local favorite, this store is worth stopping by for a look around and a cup of coffee. Come to P.S. Books on a Sunday and, in addition to a huge selection of used books at great prices, you’ll find owner Yuval Gans (who named the store after his daughter’s first two initials) hosting a sing-along for children. Kids are an important part of P.S. Books’ audience, but they stock titles that will be of interest to adult readers, too, including everything from art books to discount contemporary literature. The warm, worn vibe of the story offers a welcome change from Dumbo’s more-than-occasionally overly trendy atmosphere. And if you really want to get into the Sunday singalong, there’s a miniature xylophone for in-store jamming! Although The Complete Traveller Antiquarian Bookstore is specific to travel-themed literature, this Manhattan bookstore earns its title of “complete”: Contained on its shelves, you’ll find history books, an extensive selection of New York City literature, vintage maps and books exploring nearly every area and aspect of adventure. The prices here are steeper than the average used book shop, but the quality of the material — many of it rare or first edition — makes the cost worthwhile. And if you just want to look around, don’t worry, travelling through this shop is an adventure in and of itself. Though independent bookstores’ sales were in decline for several years, there’s recently been a resurgence in sales for local booksellers. Hopefully, this means the emergence of even more privately owned new and used bookstores to add to our list! But where’s your favorite neighborhood spot to shop for paperbacks? Barnes and Noble certainly isn’t the place to be if you want to down a glass of wine with your contemporary fiction, but is there anything chain bookstores have that independent places are lacking? Let us know all about it in the comments below!